Additional guitar solos by: Gus G, Kai Hansen, Magnus Karlsson, Michael Klein, Alfred Koffler, Mandy Meyer and Simone Mularoni. Songs written by: Alessandro Del Vecchio, Magnus Karlsson, Jani Liimatainen, Fabio Lione, Aldo LoNobile, Simone Mularoni, Michael Palace and Olaf Thorsen. 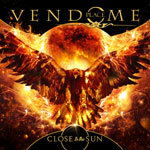 Close To The Sun is the 4th installment in Place Vendome's catalogue and out of a marketing aspect this record is put out just in the right moment to follow the announcement of Michael Kiske's return to the stage with Helloween in the fall of 2017, where he will perform classic songs off the two parts of the The Keeper Of The Seven Keys era. Once again outside writers have penned the album for this record company assembled unit. This course of action isn't what hard rock or metal fans are used to, where bands don't write most of their own music, but since there's a whole universe of artists from different styles of music out there that capitalize on such an approach, maybe heavier music will eventually move towards that path as well, even if I personally don't hope so. A few of the contributors have made some songs for this project before and we see a couple of familiar names when it comes to these types of label made products, like Magnus Karlsson of Primal Fear and Frontiers employee Alessandro Del Vecchio. This record for the most part comprises melodic hard rock that comes out maybe a little too much in some kind of designated pattern. The songs provided comply with a given format in order to fit the well-established model for this type of music and the riffing all over is following a pretty ordinary routine. Obviously the songs are made to meet the requirements of Michael Kiske's voice once again, yet some steps away from the standard template every now and then would probably have made the record more interesting in the end. It's indeed a bumpy record, in terms of song quality, where a few tracks are quite captivating while some are just like idling engines, whereas they are running, nothing of real value is in fact coming out. I reckon that most people know the feeling where you have listened to a record quite a few times and it never does the job to the full, really. It never takes that final jump to reach the next plane, but at the same time it's miles away from being bad too. Close To The Sun is exactly that type of record to me and it will probably be, no matter how many times I choose to listen to it from now.